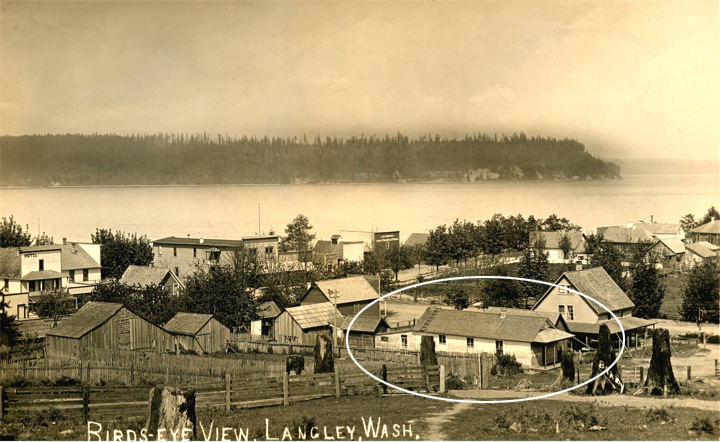 In May of 1902, The Langley Improvement Company deeded back to Jacob Anthes all of the real estate in the company for the price of three thousand dollars. Trails and roads were being built to the interior of the island. Settlers were trading at the Anthes store. With development-taking place, there was a need for temporary housing for loggers and brush cutters as they worked to clear the land around Langley. In 1902, Anthes built the “Logger Bunk House” which would stand beyond the days of loggers and brush cutters. 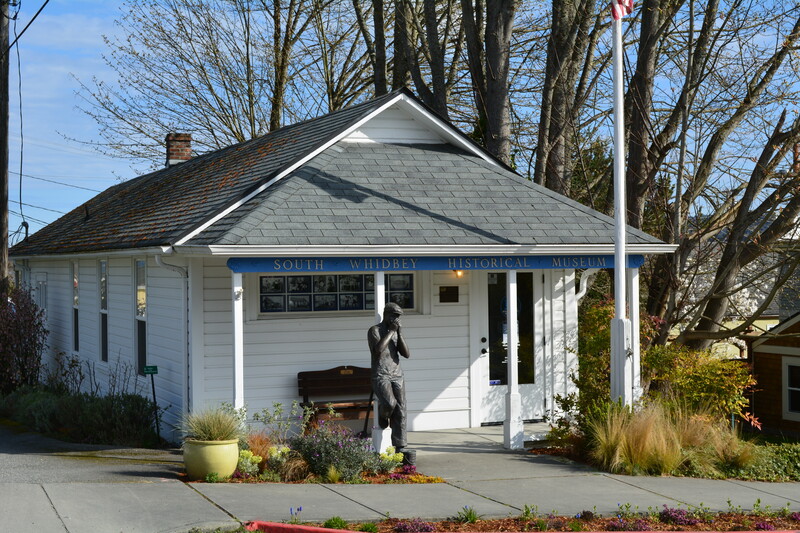 Today it is the home of The South Whidbey Historical Society Museum. Anton Myre Anderson, with his wife Josephine, nine-year-old son Otto, and two-year old daughter Alma, arrived in Langley in August of 1904. He was a skilled blacksmith and carriage maker. Jacob Anthes had met Anderson previously and told him that Langley was in need of a good blacksmith. They had left Texas after losing three of their children to typhoid–malaria. They moved to the northwest seeking a better climate. The family settled in Langley hoping to start life anew. It was not long before Anderson borrowed fifty dollars and bought the Logger Bunk House from Anthes. He would live there for the rest of his life. The blacksmith shop became one of the busiest places in Langley. Draft horses, farm horses, and horse and buggies were a common site on the street. Anderson picked up the nickname “Blackie.” When he shoed the horses, it became a show to watch. Sparks would fly as he pounded on red-hot iron. With a heavy Norwegian accent and a dry sense of humor, he would calm the horse down as he nailed the perfectly fitted shoe on to the horse. He was known around town as one of the best local fisherman. His daughter, Alma, described the time they would row to Baby Island and picked up clamshells. Anderson then rowed the shells to Edmonds where he sold them to chicken farmers. “Blackie” Anderson and his family became part of the Langley community and their home was the “Logger Bunkhouse.” When Anderson died in 1933, he willed the house to his daughter Alma. She kept the house for the rest of her life. The Logger Bunkhouse was now referred to as “Old House.” Over the years, the building was rented. In 1965, Alma and her husband Fred Grist returned to live in Langley. They briefly lived in “Old House” while they built a new home a half block away. Alma Grist Anderson willed the “Old House” to The South Whidbey Historical Society. It was refurbished and opened as a museum in 1992. However in 1996, when the floor of the museum fell past its joists and hit the ground, the historical society decided it was time to start renovating. During 1997 & 1998, total reconstruction occurred. Original features like the front porch were restored. Office, storage space, and a concrete foundation were added. The museum re-opened in December of 1999. Today, the statue of the brush cutter hums away on his harmonica on the front porch of museum hoping to make an extra dime. His presence conjures up thoughts what it must have been like one hundred years ago as settlers came from lands far away to start a new life as a new town was being carved from wilderness. The museum holds and displays those stories so they cannot be lost.